Mina Lobo from Some Dark Romantic and David Macaulay from Brits in the USA are hosting the Big Reveal Bloghop. 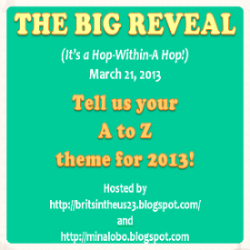 Bloggers who have signed up for the Blogging from A to Z April Challenge are letting us know about what their theme is going to be. Ok so I am going to do Demons. I am going to talk about all sorts of demons, but these will be firmly rooted in an RPG environment point of view. How to add them to games (all sorts) and things like that. All leading up to their inclusion in my oft-delayed Eldritch Witchery. I suppose some explanation is in order about EW. Yes. It's late. Part of the deal is that it needed more editing than The Witch did. Also I was talking with Jason at Elf Lair Games and we wanted to merge in the bits from my Celtic game that we are no longer doing and the delayed Demons & Devils book. The nice thing is you will get a much larger book in the process. So join me as we go investigating the evilest creatures of myth and fairytale! I would say you choose right. Although vampires are very popular, I would like to see what you come up with demons. There are a lot of demons in D&D. Demons! I did a lot of demon research for a novel I was working on, so I look forward to seeing what you have. Very much looking forward to it, there must be all sorts of interesting demons out there. very impressed you can do a whole A-Z on demons, thanks taking part in the hop. Demons yay. I love demons. Can't wait to see who or what you come up with.